Below you will find a list of all the Playnow Casino bonuses - offered to new players. The right side offers a casino overview (click to scroll through the images). PlayNow was launched back in 2004 and is a brand that is recognized throughout British Columbia and Manitoba. This is the only provincially-run legal online casino in BC and Manitoba that offers online gambling for residents in these provinces with plenty of great games and jackpots up for grabs. 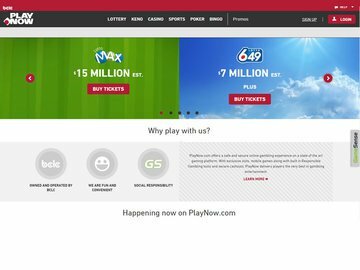 The site is owned and operated by the British Columbia Lottery Corporation in conjunctionwith the Interprovincial Lottery Corporation. The original site was only available in BC but in January of 2013, an internet casino for residents of Manitoba was launched. 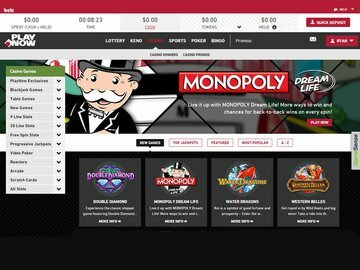 The official Manitoba site was launched by Manitoba Lotteries and it offers many of the same games as its BC counterpart and shares a poker network with the BCLC's other gaming sites . The PlayNow online casino features Vegas casino games, sports betting, lotto, bingo and poker games that can be accessed via pc or mobile devices including the iPhone, iPad and Android. PlayNow Casino has received a lot of media attention in Manitoba and British Columbia and they have even been featured on Canadian television stations such as TSN, CTV and more. They spend a lot of money on marketing and advertising so you are sure to have seen their ads. They have billboard ads, TV ads, and of course they are regularly featured in radio advertising on stations such as CBC Radio 1, The Beat, Co-op Radio, Star 94.7, Virgin radio and more. The provincial online casino has plenty to offer residents of both BC and Manitoba and we are sure there is a lot more to come too. Unlike the big international online casinos, the provincially-run legal online casino doesn't offer a lot of casino bonuses. There are some free spins slots games, but when it comes to sign up bonuses you really are out of luck. At the time of this review, the promotions page stated that the sign-up bonus was 'coming soon', but this notice has been listed on the page for the past 6 months. When compared with international casinos, this not very attractive considering well verse Canadian online casino players are used to getting no deposit bonuses or match bonuses up to $1,000 Free. If lottery, poker, bingo or sports betting is more your thing, you will find ongoing promotions that you can take advantage of. These include Keno double up promotions in lottery, a 100% bonus on soccer parlays, and massive poker tournaments with freerolls for all new players. If you are interested in taking advantage of any of these special offers, we advise that you read all the terms and conditions carefully first. Software and of course games choice is what really brings casino games to life. The bigger the selection of games you have the more fun you can have. The site features just over 100 games via the licensing agreement it has with Spielo G2. This software company has some of the most online gambling experience in the world. Established over 20 years ago, SPIELO G2 was known as Boss Media. The company has transformed several times over the years through acquistions and mergers, including one of it's more recent names - GTECH. As part of the Italian gaming giant Lottomatica, SPIELO G2's most recent acquistion of IGT now makes it one of the largest online gaming companies in the world. The software used by online casinos is one of the most important factors to ensure gaming entertainment. While SPIELO G2 is a solid platform and one that is preferred by several state-regulated jurisdictions, the PlayNow online casino suite does not include any of the top software brands such as Microgaming, Playtech or NetEnt. If you've been gambling online for more than a couple of years, you'll notice that most of the popular slots games you may be used to playing, won't be found here. That's isn't such a bad thing though and you will be happy to learn that a lot of the games on this site are also found in casinos in Las Vegas. There are free spins bonuses available on many of the slots games which gives you plenty of action and fun and with the all the titles only being available to residents of BC and Manitoba, there is more of a chance of winning a progressive jackpot too. In total, there is a wide selection of games including slots, blackjack, sic bo, roulette, baccarat, video poker, arcade games and scratch cards. There are also some great progressive jackpot titles including Chain Reactors and Super Cubes. Players can also enjoy sports betting, bingo, lottery and poker. All the games can be played on the free downloadable software and players will also be delighted to hear that the provincial online gambling site is also available on mobile devices. You can play your favorite games on your iPhone, iPad, Android and Blackberry device. These is great for those who like to play on the go and the graphics are pretty good too. Registered players can make deposits and withdrawals using verified Visa, Mastercard, Interac Online and Online bill payment. There is a minimum deposit of $5 required. There are some great security features available at this site including a weekly transfer-in limit which players can set. It can be anything from $1 to $9999 and this is the maximum amount that can be transferred from their bank to their casino account each week. There are very strict age and residency controls in place and there is also a player pre-set deposit limit with 24 hour delay for all increase requests. Responsible play is encouraged and all information is kept safe using the latest encryption methods. GameSense is a feature that is also available to help players make informed choices and understand games, the odds and the potential risks. Should you need any help, customer support is available via email, live chat and telephone. Live support is provided daily from 7am to midnight PST with poker support available 24/7. There is also an extensive help seciton on the website where you will find the answers to the frequently asked questions. Overall, we rate PlayNow (casino product only) a 7/10. The responsible gaming program is among the best in the world. Fast and easy payment methods are a plus. The world class software is good, but lacks (slots) game selection and progressive jackpot sizes. What the site really lacks is promotional activity. We presume the BCLC is concerned with the fine line between marketing and promoting irresponsible gambling which is inevitable for any crown corporation running a gambling monopoly. So, is the provincial site right for you? Well, that really depends on what you are looking for. If you are looking for a legal, provincially run online gambling site for British Columbia and Manitoba, then the answer is yes. This is a safe and regulated site that has been designed specifically for Canadian residents. The site is available on mobile devices and it offers casino, bingo, lottery, poker and more all in the one place. If on the other hand, the site lacks the massive bonuses, a huge selection of titles and top software providers that some of the biggest and best online casino brands offer Canadians.